Redesigned the pan and pinch gesture handling code. A diagonal pinch always results in a proportional zoom, so it does not alter the grid's aspect ratio. A near vertical pinch only modifies the y-axis, while a near horizontal pinch works on the x-axis. The calculator also supports zooming and panning while graph is in "trace" mode. The "shake to reset grid" feature defaults to a square grid. As opposed to -10 to 10 for both the x and y axis. Removed the "Zoom mode" option from settings. Thanks to the new pinch handling code, it's no longer needed. Removed the "Draw while touching" option from settings. It will always be turned "on" going forward. Starting with this version iOS 4.0 or higher is required. Right now, the iPad version of the calculator is a few versions behind the iPhone app, but an update is coming shortly to bring all of these features to the iPad app. The version numbers will be synced as well, so the iPad version will jump to 1.4 also. Added the ability to graph inequalities. Added conditional statements that allow restricting the domain and graphing piece-wise functions. Relocated the 'x' button, and made it blue. Many people were having problems finding it in the previous version. Modified the calculator history so that both the input and the answer can be recalled, depending on which half of the screen is touched. Created new functions for calculating the greatest common divisor and least common multiple. Added nroot(), which allows you to calculate the nth root of x without having to use the power function. Added logbase() for calculating the log of any base. Fixed several minor bugs that people found since the last update. I would like to thank everyone that e-mailed me. Note that all new features require iOS 4. The application will continue to work as before on iOS 3, but it will be missing these new features. Added VGA output. This feature requires that you have an iPhone4, a 4th generation iPod Touch or an iPad. Earlier devices do not support Apple's VGA adapter. Fixed a bug in the acsc() function, which caused it to return "syntax error". Fixed a bug responsible disabling the "edit" button on the equation's tab. This update fixes bugs that were introduced in the 1.2.0 update. No new features were added. Changed the equation editor so that moving the cursor is easier. The magnifying glass shouldn't be covered by the user's finger anymore. Fixed a bug responsible for the equation editor keyboard to stick around after editing an equation. Fixed a bug in evaluating user functions on the calculator screen. When pressing the open parenthesis key, the app will automatically place a multiplication sign after numbers or variables. A few people asked why the updated keyboard is not supported on firmware 3.x. In order to use Apple's standard UITextView along with a custom keyboard, I had to make use of an API that was introduced in SDK 3.2. Since the iPhone and iPod went from 3.1 directly to 4.0, I had to restrict the new keyboard to devices running 4.x or higher. Of course the old keyboard will continue to work on devices running firmware 3.x. Fixed a sampling problem that resulted in vertical portions of graphs not being drawn. Improved the root/intersection finding algorithm. Added a proportional zoom option. Fixed a problem related to the "ans" key. Calculator history is now saved when you quit the app on iOS4. Everything you see listed for version 1.1.10 of the iPhone/iPod app. Added video output support, which was requested by several teachers. 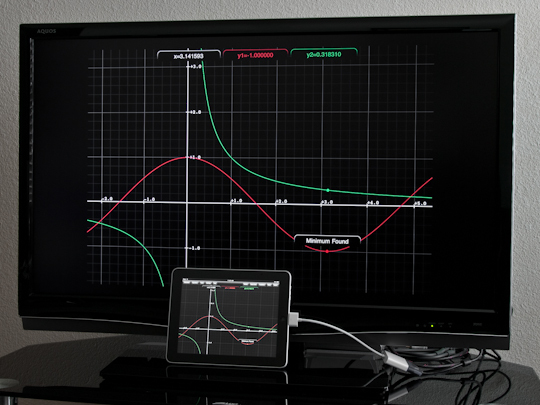 You can now connect the iPad to an external monitor in order to display the graph view. Added a left-handed keyboard layout option that repositions the number pad. A feature that quite a few teachers requested recently is VGA output, so that they can display the graphs on a projector or TV. Actually, many people asked for this over a year ago as well, but there was no public API available in the iOS SDK. With the introduction of the iPad, Apple enabled developers to make this happen, and I will be supporting it in the next release. It will be available in both the iPhone and the iPad version of the calculator, and you'll be able to use any of the video cables (component, VGA, or RCA). The 2G and 3G iPhones will not support it because of performance issues, so you'll need at least an iPhone 3GS.